These techniques help us make each and every class a sort of mini islamic studies class so that our students never differentiate the acadenic studies from islamic studies and vice versa. Taekwondo is a Korean martial art. 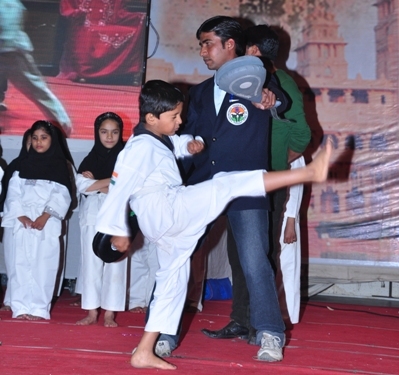 It combines combat and self-defense techniques with sport and exercise. Our mission is to promote health ,self- defense, responsibility, respect, courage, and confidence through training and hard work. We strive to instruct martial arts as a complete discipline (mind, body, and spirit), which teaches not only self-defense but also strives to develop coordination and sound character. Our vision and hope that this legacy be carried down to our children who can become the guiders for the world. Seeking Upto date highly skilled & trained teachers is our long term aim and mission.